I have a little experience on Avid and I am under the impression that when you capture or import MXF files (think of XDCAM), Avid will translate those files into MXF OP-Atom (SMPTE 290M). It's easy to export Op1a MXF from Avid. Here our first target is transferring Avid MXF to Final Cut Pro. To be specific, we are talking about how to fastest export from MXF Op1a to MOV with ProRes Codec. As we know, Avid works natively with MXF files but not FCP. 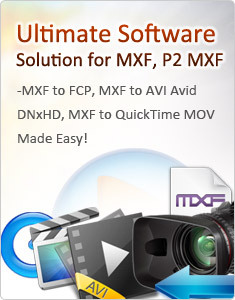 Aunsoft TransMXF for Mac is the most efficient solution to encode Op1a MXF to ProRes. This program utilizes all cores to achieve 6X faster conversion speed. I can directly load multiple MXF from different folder and do batch conversion at once. Since many converters only allow me add MXF file one by one, I appreciate this feature much. What I must mention here is the batch conversion and "Shutdown the Computer" set are really helpful when you are dealing with large amount of files. Another high light of TransMXF for Mac is it solves audio issues when transcoding MXF Op1a to FCP X, such as audio out of sync, audio missing and audio cut-off. I learn that the program can automatically load audio counterparts when I load MXF file. After Avid MXF to FCP conversion, the output format will be with audio too. I accidentally click "edit" icon in the main interface and I find I can preview original file and output video simultaneously. Here initial editing, such as cropping, trimming and deinterlaing, are available. Adopting advanced audio/video synchronization technology, The Pro can guarantee perfect audio and video sync after editing and conversion. Below is a simple tutorial to help you export from MXF Op1a to MOV for Final Cut Pro X. You can import MXF content via clicking "add video" or "add folder" in the upper corner or just drag file to the program directly. In this step, you may encounter that source with just video but no audio. A suggestion is to click "add folder" to load the entire MXF whole structure folder to avoid of missing audio caused by metadata loss. And it's better to preview the raw XDCAM MXF files in the preview window to avoid of no audio in output MOV. Click "format" and under the FCP menu, you can clearly see proper formats for FCP, among which, native codec to read Op1a MXF files in FCP X, including ProRes 422 and ProRes 444. ou can also directly enter FCP in the search bar, even faster. ProRes 422 HQ is recommended here for offering even greater headroom to preserve the quality. Set proper frame rate is important. 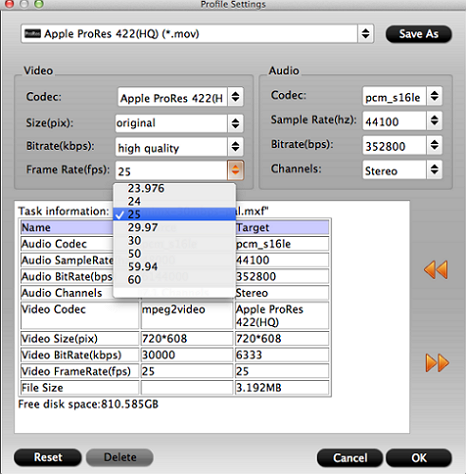 The video frame rate is up to 60fps under the ProRes 422 format profile settings. After much verification, here suggests 25P in PAL (30P in NTSC) to keep high video quality and smooth edit in FCP X. Before, you can also adjust other settings, like video size, video bitrates, audio channels, etc. Click "Conversion" icon that TransMXF for Mac will convert MXF Op1a to ProRes MOV at high speed. With just a click on "Open output folder", you can locate the export ProRes MOV easily.